We’d love your help. Let us know what’s wrong with this preview of Brooklyn on Fire by Lawrence H. Levy. To ask other readers questions about Brooklyn on Fire, please sign up. Brooklyn on Fire is a fun book filled with history, famous names and corruption. There is also Mary Handley. Mary is an officer with the Brooklyn Police Department and she has goals of becoming a detective. When Mary is presented with a twenty year old mystery she sets about to determine exactly what happened. The truth is very well hidden and the facts are very confusing. Of course it all makes sense after a while, but it is a fun story of the olden days of New York. I liked her relationship wi Brooklyn on Fire is a fun book filled with history, famous names and corruption. There is also Mary Handley. Mary is an officer with the Brooklyn Police Department and she has goals of becoming a detective. I liked her relationship with George. They are a feisty pair and it kept it fun. There are many different crimes going on at the same time. It kind of felt like the story slowed in the middle. The pace then picked up momentum and I was again interested and curious as to how it was all going to pan out. For history buffs it is going to be a fun read. For mystery buffs it has plenty of angles to keep us guessing. I was glad to see some of the impressive names involved such as the Vanderbilts. I am glad I held on through the middle. I liked how Lawrence H. Levy thinks. I received this book from Blogging for Books for this review. I was glad I chose this book to read. It was a good choice. I was looking for a little something different from my usual romantic suspenses and mysteries set in history. Most are from the same period and place. This one had the distinction of being set late in 19th century America amongst the hustle and bustle of New York City. Famous personages roaming freely amongst the author's original characters and a twisting mystery and a litle romance was just the thing. This is the second book in the Mary Handley series. While there were several references to the I was looking for a little something different from my usual romantic suspenses and mysteries set in history. Most are from the same period and place. This one had the distinction of being set late in 19th century America amongst the hustle and bustle of New York City. Famous personages roaming freely amongst the author's original characters and a twisting mystery and a litle romance was just the thing. But others have plots and plans going on in the shadows working around Mary's case. Collis Huntington and other great men of business empires battle over the annexation of Brooklyn to New York and other plots to bring each other down. Her brother is assigned the murder case of an older reclusive woman which brings a brutal killer out to keep the Handleys from getting close. An actress is found dead and Mary's own case takes a turn for the bizarre. New York's high society comes to call when debonair George Vanderbilt finds Mary delightful and offers to detect alongside her as her assistant. When her brother is framed for murder and someone is pulling the strings of the justice system, Mary must work even harder and faster to solve the several murders and secrets she has on her plate. George is there and supportive, but Mary can feel the wolves snapping at her heels. Now's her big chance and there is a lot riding on it. I had a hard time settling into the style of the writing. It felt stilted and it kept me at arm's length so I could never fully engage. There were some potentially emotional scenes and those were the ones that drew me in the most, but even then I wasn't fully immersed. Then there was Mary, herself. I both liked and didn't like her. Her 'know it all' attitude and prejudices against the wealthy (which she denied though her thoughts and actions prove her wrong) were a turn off. The author made her vulnerable in the sense that she made a few errors and she was remorseful and learned from them. But generally, she is convinced that she is all that. I did find her humorous many times when she got a bit stuck up about her superior intelligence). And to be fair, I would assume any woman trying to buck tradition and society's rules about women would have to be pretty gutsy and strong-minded with a solid belief in herself. Being me, I can never let it stand at one word. The relationship between our heroine, Mary Handley, former sweatshop worker (as the reader is reminded over and over), and George Vanderbilt, of THOSE Vanderbilts, is … absurd. Is it impossible for a rich man to fall in love with a poor girl? Of course not. Is it feasible in – was this 1889 or 1890? Not really, no. Mary's reaction was believable - I love you but I'm not sure I trust your feelings, and can we really make th Single-word review: clunky. The relationship between our heroine, Mary Handley, former sweatshop worker (as the reader is reminded over and over), and George Vanderbilt, of THOSE Vanderbilts, is … absurd. Is it impossible for a rich man to fall in love with a poor girl? Of course not. Is it feasible in – was this 1889 or 1890? Not really, no. Mary's reaction was believable - I love you but I'm not sure I trust your feelings, and can we really make this work? George's – never noticing any difference in their situations whatsoever – vaulted past "Aw, he's such a gentleman" to "seriously, was he hit on the head recently?" Mary had a dilapidated one-room apartment. George was building … THIS. I mean… seriously. It's the largest home in the United States. There's an audio tour you can take of the house alone which takes ninety minutes. (It wouldn't take ninety minutes for a tour of my whole town.) There should have been some reaction, or at least acknowledgement – but he says nothing and behaves as though she brought him to see her suite at the Ritz. But okay, let's say he truly was blind to the difference in their situations, and she could get over it. The circle in which they would be traveling – his – would never get over it, and she, and therefore he, would be ostracized forever. Cinderella at least had noble parents. Mary comes from a true-blue-collar background, and would probably tell people she once worked in a sweatshop. I think the idea is that Cinderella would charm her way in to her new life, and make people forget about the ashes. Mary doesn't have that kind of charm. George Vanderbilt is portrayed as a nice guy. I'm surprised at how little I can find about him online; this book does appear to be accurate in terms of his goals of ahead-of-his-time ecological concern and land management; he may well have been a nice guy. But the level of cluelessness with which he happily and proudly shows off his monstrous country home – not his permanent home, his country home, which, I repeat, is the largest home in the United States – to a woman whose father is an assistant butcher - is monumental. Advanced thinking in terms of environmental concern does not necessarily translate to advanced thinking in terms of class and social standing. The kind of marriage they would have would be difficult now – then? Absurd. One problem with reading a printed book as opposed to a digital edition is – well, one I never considered before. Where it can be a very minor annoyance now and then not to have easy access to the covers of e-books, it never occurred to me that having the physical book, where my eye kept falling on the blurb on the back cover as I schlepped it hither and yon, could also impact my feelings about the book. To wit: "LAWRENCE H. LEVY is a highly regarded film and TV writer who is a Writers Guild Award winner and two-time Emmy nominee. He has written for various hit TV shows such as Family Ties, Saved by the Bell, Roseanne, and Seinfeld." The further I got into the book, the more I kept thinking that a) out of those series the only one I liked at all was Family Ties, and b) the ability to contribute to a half-hour contemporary situation comedy does not necessarily translate to the ability to write a mystery novel set in the nineteenth century. "Okay" is perfectly, er, acceptable in a sitcom. I could be utterly wrong – it might have been quite common for everyone to say "okay" in 1890. I don't think so, though. As I've said elsewhere, if I had more confidence in the writing I'd be more willing to give it the benefit of the doubt, but when someone wears a "huge smile, truly from cheek to cheek" (aren't they all? The cheeks being on either side of the mouth? Isn't that a mixed cliché? ), or when the reader is assured that George "knew what to do in order to assure Mary had the best treatment"… and so on, and so forth … no. There is no inspiration for confidence. The predictability of the story is not helpful. I knew from early on that one of two people would die, and was right, and it was tedious and unconvincing. However, the cover, and in fact the title, led me to expect a spectacular climax. It wasn't, so that prediction was incorrect. And I have to say that knowing exactly who was committing the murders and why from just about the very beginning of the book, while it took predictability out of that part of the picture, also removed any suspense or … well, interest. I ended up dnf'ing the first book in this series because it was incredibly boring but I won this second book, Brooklyn on Fire, before I started the first so I was hoping it would be better since Second Street Station was Levy's debut. Well unfortunately I didn't care for this one anymore then I did the first. It again was boring and the writing and story just didn't flow well to me in either book. I also felt absolutely nothing for any of the characters so I'm calling it a wrap and moving on to something else. It may be that this series just isn't for me so if you read it, I hope you enjoy it more then I did. Before I start my review, let me say that it is not imperative to have read the first book in the series to enjoy this one. Yes, there are tidbits of background information that you may have missed but Mr. Levy does an admirable job of imparting the important bits so that this can be a “stand alone” read. With limited career options open to her as a female Mary has weighed out the pros and cons of various possible job choices. After helping solve the Goodrich case Mary has decided that she would Before I start my review, let me say that it is not imperative to have read the first book in the series to enjoy this one. Yes, there are tidbits of background information that you may have missed but Mr. Levy does an admirable job of imparting the important bits so that this can be a “stand alone” read. With limited career options open to her as a female Mary has weighed out the pros and cons of various possible job choices. After helping solve the Goodrich case Mary has decided that she would make a great detective. Never one to let social norms and expectations stand in her way and only too well aware of the fact that in early 19th century New York City women DID NOT become police officers, Mary sets up shop as a private investigator in a small back office (cleaned out broom closet) of a bookstore. Convenient, as her job in the bookstore helps her make ends meet. She has the time … she has the business cards … she has the determination – now all she needs are some clients. Mary is as surprised as anyone when a young woman comes into her “office” and hires Mary to look into the death of her uncle who supposedly died of a heart attack several years ago. Little did Mary know when she accepted this case that it would lead to her butting heads (and other body parts) with the upper echelon of New York society, the Vanderbilts, the Rockefellers and the Carnegies. As Mary delves deeper into her case of suspected murder there are many surprises on the way for both Mary and the reader. As in the first book of the series actual historical figures abound, important issues, events and scandals of the time are cleverly woven into the story. The reader is skillfully transported back to New York City of the 1800’s. These truths entwined in the story make this interesting historical fiction and Mr. Levy’s characters make it an entertaining read. Even Mary Handley was a real person and, although I have not taken the time to look into her history, I feel sure Mr. Levy has taken a few liberties with her character. On the positive side – I really enjoy Mary, her way of thinking and bucking tradition, her attitude and her intelligence/clever instinct. Also, as they did in “Second Street Station” Mary’s mother and father offer some fun comic relief throughout the story … especially her mother, who is written so well as a shining example of a woman bound by tradition, the polar opposite of her daughter, in whom she is equal parts disappointed and extremely proud. I also very much liked Lazlo, Mary’s employer, provider of her office space and biggest supporter. Should there be a third book I hope he makes an appearance. There is something I will be watching for should there be a third installment in this series. While I would definitely recommend this book to anyone that likes a lighter historical fiction read for me there were a few issues. The foremost being that this is only the second book in this series and it already has that “cookie cutter” feel; as if Mr. Levy found a formula that worked in the first one, altered some names, came up with a new mystery and plugged it in to the pages. It did help move the story along and allowed me to learn about a something new, however, if Mary is going to have a new and tragic love affair in each book it may put me off continuing with the series. All in all a good read and I would definitely pick up another book in the series just to see where it takes Mary. I received this book at no charge from the publisher, Crown Publishing, via Netgalley in exchange for an honest review. This review has been hidden because it contains spoilers. To view it, click here. I received a copy of this book from Netgalley in exchange for an honest review. I do like a good historical mystery, so I'm always willing to give a new author a try. However, this book definitely did not do it for me. The book takes place in 19th century Brooklyn, before it was subsumed into New York City. Truthfully, I did not make it that far before deciding to skim, but it looks like water rights were an issue here. Mary Handley wants very badly to be a detective, and she is so preternaturally I received a copy of this book from Netgalley in exchange for an honest review. The book takes place in 19th century Brooklyn, before it was subsumed into New York City. Truthfully, I did not make it that far before deciding to skim, but it looks like water rights were an issue here. Mary Handley wants very badly to be a detective, and she is so preternaturally, Mary Sue-ishly competent that she could pull it off, if only someone would hire her. She's whip-smart, proficient at both karate and savate (I may have missed some other martial arts that she studies), down-to-earth, a sense of humor that she shares with the author (if you like the author's sense of humor you'll like Mary better; alas, I did not) and is beautiful of course. Also she knows pretty much everything. Literally. When asked, she knows how many cities called Brooklyn there are in the United States off the top of her head. She can do everything better, twice as fast, and in high heels and backwards. Mary's only problem is that she doesn't come from a good family and has caught the romantic interest of a Vanderbilt. My problem with the book is that while it's clear that the author has done tons of research, he has not yet mastered the art of incorporating that research seamlessly into his fiction. I do love learning things while reading fiction, but there was quite a bit of info-dumping here. I couldn't attach to any characters because they seemed like characters, not people. Also, at the end of the book (you saw the spoiler tag, right?) Mary is in a fight for her life in a rainy alley. She sees lightning hit a lightning rod, grabs the grounder for the rod and throws it into the puddle that the bad guy is standing in to kill him by electrocuting him. Soooo... lightning is pretty fast, right? Mary isn't wearing gloves or anything else to protect her from the LIGHTNING FAST LIGHTNING coming down the rod as she touches it to throw it into the puddle. Wouldn't she have gotten lit up like Ben Franklin's kite too? Someone with more scientific knowledge- tell me if I'm wrong! If you're interested in a historical mystery about New York City that does a better job of blending research, plot and character, I recommend Lindsay Faye's "The Gods of Gotham". This is the second book in a series based on Mary Handley, lady detective. Based in New York City and Brooklyn before they were consolidated, it surrounds a series of events that are both politically and personally motivated. Now, normally I would go ahead and describe some of the story as I had interpreted it, etc etc etc but quite frankly I don't want to. The author is quite capable of good writing obviously as this series has gotten good reviews from better readers than I, but I couldn't wait This is the second book in a series based on Mary Handley, lady detective. Based in New York City and Brooklyn before they were consolidated, it surrounds a series of events that are both politically and personally motivated. Now, normally I would go ahead and describe some of the story as I had interpreted it, etc etc etc but quite frankly I don't want to. The author is quite capable of good writing obviously as this series has gotten good reviews from better readers than I, but I couldn't wait to put this book down forever. There are times when too much activity in a story detracts from the reader's enjoyment of it. After awhile, I felt like I was being force feed a story line that was morphing into a caricature of itself; story line not so subtly showing it's movie script skeleton. Each new addition to our cast just seemed so two dimensional that I couldn't care about them for more than a few pages before I just wanted to ask them to politely jump off the Brooklyn Bridge itself. Although there are some actually interesting facts sprinkled throughout the book, the liberty taken with some of them leaves you feeling like you are on the losing side of a bad joke. From the writer of "Second Street Station," comes a new adventure of Mary Handley who was the first female police officer in Brooklyn. Mary wants to become an official detective instead of only being called on for certain cases. She gets her first case when Emily Wortham believes that her uncle was murdered and wants Mary to look into it. Once again, the reader has the enjoyment of seeing Mary rub shoulders with such notables as John D. Rockefeller and Andrew Carnegie. She attends a lecture by Ben From the writer of "Second Street Station," comes a new adventure of Mary Handley who was the first female police officer in Brooklyn. Once again, the reader has the enjoyment of seeing Mary rub shoulders with such notables as John D. Rockefeller and Andrew Carnegie. She attends a lecture by Benjamin Franklin and shares experiences with John D. Rockefeller and George Vanderbilt. There are discussions of the political events of the time, concerning New York and Brooklyn. In this regard, I was impressed that at this time, Brooklyn was one of the largest municipalities in the United States. A woman is murdered and Mary investigates this case which became personal to her when her brother was accused of the crime. There are lots of historical references and a gutsy protagonist in Mary. As I read the story I considered what some of the TV female detectives like Beckett on Castle or the female detectives on shows like Law and Order owed to a character like Mary, who started it all. I enjoyed the story and reading about a protagonist like Mary. A historical mystery featuring Mary Handly as the protagonist. Mary is a trying to become a detective in Brooklyn in the 1800s. Emily Worsham asked her to investigate the death of her Uncle John Worsham as Emily feels it was murder. As Mary begins her case Emily is found murdered. There are two more murders, one of Mary's brother was arrested as the killer. In each, case a fire is set to burn the victim. John's background has ties to prominent Brooklyn politicians. Mary becomes romantically invo A historical mystery featuring Mary Handly as the protagonist. Mary is a trying to become a detective in Brooklyn in the 1800s. Emily Worsham asked her to investigate the death of her Uncle John Worsham as Emily feels it was murder. As Mary begins her case Emily is found murdered. There are two more murders, one of Mary's brother was arrested as the killer. In each, case a fire is set to burn the victim. John's background has ties to prominent Brooklyn politicians. Mary becomes romantically involved with a member of the elite. The plot is interesting and well written; however it did not flow together. The plot jump to each part often leaving the reader confused. Mary Handley is trying to get her consulting detective business going after helping the police solve a murder, so she's very excited when a woman comes in and asks for her help. She gets busy on the case, but there are some strange coincidences about it -- coincidences involving two other murders. And all of those murders are somehow connected to Mary herself. Needless to say, she needs to find out what's going on ... while simultaneously trying to keep her romance with wealth George Vanderbilt Mary Handley is trying to get her consulting detective business going after helping the police solve a murder, so she's very excited when a woman comes in and asks for her help. She gets busy on the case, but there are some strange coincidences about it -- coincidences involving two other murders. And all of those murders are somehow connected to Mary herself. Needless to say, she needs to find out what's going on ... while simultaneously trying to keep her romance with wealth George Vanderbilt going. Author Lawrence Levy puts readers square in the middle of 1890s New York, with scenes ranging from Brooklyn tenements to upper crust mansions. 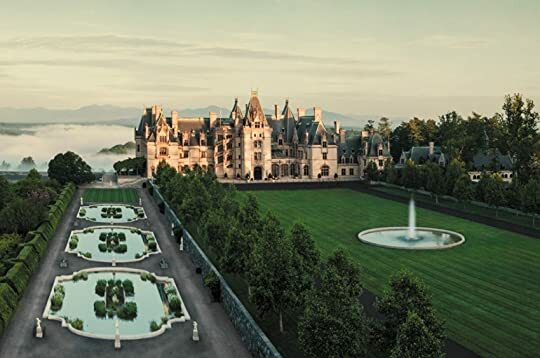 Peopled with historic figures like Cornelius Vanderbilt and Andrew Carnegie, the book is rich with entertaining characters both real and invented. 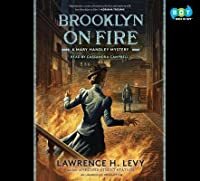 Lawrence H. Levy in his new book “Brooklyn On Fire” Book Two in the Mary Handley Mystery series published by Broadway Books gives us another adventure with Mary Handley. After closing a case with the Brooklyn Police Department, Mary Handley is determined to become an official detective in her own right. And when Emily Worsham shows up at her new office— convinced her uncle John Lawrence H. Levy in his new book “Brooklyn On Fire” Book Two in the Mary Handley Mystery series published by Broadway Books gives us another adventure with Mary Handley. As she investigates the curious circumstances surrounding John’s death, Mary soon finds herself entangled in a high-stakes family scandal, a series of interconnected murders, political corruption, untrustworthy sources, and an unexpected romance with a central member of New York’s elite–offering a life of luxury Mary fears she could get used to. Get ready to be transported back to 1890. This is high quality historical fiction Lawrence H. Levy has written a page-turning thriller. Mary Handley’s second case and it is a doozy, a triple-murder. Mr. Levy has given us a terrific character that we root for and want to succeed and hang out with in Mary Handley. Maybe a few times you might see what is coming next but that is because you are good. Most times you will be blindsided and you will want to read faster to keep up with the action. Get ready for a very interesting read that will keep you flipping pages. Mary Handley, New York’s first female detective is on the case again in Brooklyn on Fire, the second of Lawrence H. Levy’s Mary Handley Mysteries. This fun and intriguing historical mystery is set in 1890s Brooklyn and includes many of the movers and shakers of that time period: railroad magnate Collis Huntington, New York city planner Andrew Haswell Green and Hugh McLaughlin, head of the city’s Democratic Party. 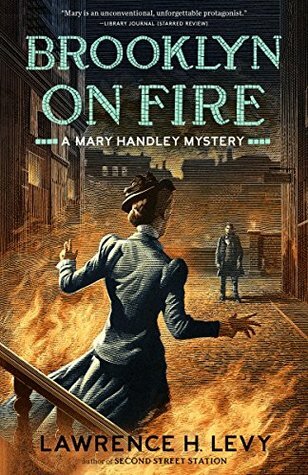 Rounding out the crowd are the ultra-rich and powerful Vanderbilts, Rockefellers an Mary Handley, New York’s first female detective is on the case again in Brooklyn on Fire, the second of Lawrence H. Levy’s Mary Handley Mysteries. This fun and intriguing historical mystery is set in 1890s Brooklyn and includes many of the movers and shakers of that time period: railroad magnate Collis Huntington, New York city planner Andrew Haswell Green and Hugh McLaughlin, head of the city’s Democratic Party. Rounding out the crowd are the ultra-rich and powerful Vanderbilts, Rockefellers and Carnegies. An intimidating group like this is no match for the unflappable Mary Handley, who is sharp-witted and fast on her feet. Challenges await her, however, when she is hired to investigate the long-ago death of Arabella Huntington’s first husband, John Worsham. Politics, scandal and shady characters muddle the plot and point Mary in different directions. At Brooklyn’s Second Street Station, Mary’s brother Sean investigates a recent murder, and when a shocking tragedy rocks the Handley family, Mary must redirect her efforts to save her brother. No story would be complete without a little romance and when Mary meets a certain wealthy bachelor, she develops a taste for the finer things in life. An added benefit: Mary’s new beau puts her in good standing with her mother, who is eager for Mary to marry. But will the relationship last? There are plenty of side characters and sub-plots to keep the reader guessing. Amusing dialogue and interesting historical descriptions highlight important issues of the day: women’s rights, modernization, big business and the lifestyles of the rich and poor. Levy’s frequent references to classic literature are also a nice treat and my favorite is from Charles Dickens: “You’re not Pip in Great Expectations. This is serious.” Wouldn’t it be fun to use this line in real life? Politics, mystery, action and romance run through this fast-paced plot and lead to a satisfying finish. I enjoyed Brooklyn on Fire very much and I’m looking forward to Mary’s next adventure! After being let go by the New York Metropolitan Police Department when she successfully solved the Goodrich murder (first book in the series), Mary Handley decides to become a detective. With the help of her friend and employer, Lazlo, she sets up shop in a back room of Lazlo's book store where she works. Both she and Lazlo are pleased and surprised when a young woman comes into the store and hires Mary to find out what happened to her uncle who she believes was murdered many years ago. Mary eagerly accepts the challenge, and it leads her to investigate some of the prominent families in New York. The case increases in scope when the young woman is murdered. Even though she no longer has a client, Mary vows to find the killer. Then in a surprising development, Mary acquires an assistant, George Vanderbilt. George gives Mary entre into the upper levels of society populated by the Carnegies and Rockafellers as well and the Vanderbilts. Although it crosses societal lines, George becomes infatuated with Mary and wants to marry her. The case is full of twists and turns showing off Mary's detective skills at every new development. She's a good character, spunky and intelligent, a quality that wasn't encouraged in the Victorian Era. George Vanderbilt is also a good character, but it's hard to believe in his romance with Mary in that environment. The historical setting is well developed with many details about the New York takeover of Brooklyn. I enjoyed the book. It's an easy read and the pace is good. If you enjoy historical mysteries, this is a good one. This was my first book by this author and I really liked it a lot. The main character was just so down to earth and so likable. I could hang out with Mary all day. She was my kind of girl. I really liked the historical part of it and the hanging out with the Carnegie's, the Vanderbilt's, and the Rockefeller's. This was quite the cozy little mystery with a little history, (some fac This was my first book by this author and I really liked it a lot. The main character was just so down to earth and so likable. I could hang out with Mary all day. She was my kind of girl. I really liked the historical part of it and the hanging out with the Carnegie's, the Vanderbilt's, and the Rockefeller's. This was quite the cozy little mystery with a little history, (some fact and some fiction), a little romance, (nothing more daring than a kiss or hand holding), some corruption, some murder, some enemies who became friends and a woman who saves the day. What more could you ask for in a book? I loved it and could not put it down. There was someone out to get Mary and/or her family and I had to know who it was. It had to be the biggest scoundrel of all, because Mary's family was the nicest family there was, well if you didn't count the mother. HA! I sincerely recommend this book. It will keep you interested and wondering who the puppet is that is pulling the strings and sad for Mary's love life but happy she found the killer and the scoundrels. It is definitely an entertaining read. This is a wonderful book for historical fiction lovers and mystery lovers. I missed reading the first book in series but am still hoping that I will receive it. I had no trouble in picking up the story and toughly enjoyed all the detail about the infamous Long Island Water Scandal, the historical figures involved and other well-known people in history. Such people as Andrew Carnegie, John D. Rockefeller and Cornelius and George Vanderbilt are in this mystery. Even the character, Mary Handley was This is a wonderful book for historical fiction lovers and mystery lovers. I missed reading the first book in series but am still hoping that I will receive it. I had no trouble in picking up the story and toughly enjoyed all the detail about the infamous Long Island Water Scandal, the historical figures involved and other well-known people in history. Such people as Andrew Carnegie, John D. Rockefeller and Cornelius and George Vanderbilt are in this mystery. Even the character, Mary Handley was a real life detective and this case is an actual court case. The mystery is very complex and has a lot of suspects and Mary Handley proves to be brave, very intelligent and capable. It starts out with what seems two different cases that begin to connect. An old woman living with her two cats, Albert and Vicky, somewhat of a hoarder is brutally killed. A niece requests Mary to locate her long lost uncle whom she thinks was murdered long ago. I am sure that you will not be able to forget the murderer. The pace was fast and even and the story really hooks you. I am hoping that I will still be able to read the first book in this series, Second Street Station and also the next one in this series. I strongly recommend this mystery for your reading pleasure. On the heels of assisting the Brooklyn Police Department in solving a very notable case, Mary Handley is hoping that the case would launch her career as a detective. Yet she's finding that isn't the case. When Emily Worsham shows up at Mary's office saying that her uncle has been murdered, Mary takes the case. As she investigates, she soon finds herself in the midst of a series of interconnected murders, a high stakes family scandal, and more. Yet danger is still lurking with each new clue that On the heels of assisting the Brooklyn Police Department in solving a very notable case, Mary Handley is hoping that the case would launch her career as a detective. Yet she's finding that isn't the case. When Emily Worsham shows up at Mary's office saying that her uncle has been murdered, Mary takes the case. As she investigates, she soon finds herself in the midst of a series of interconnected murders, a high stakes family scandal, and more. Yet danger is still lurking with each new clue that unfolds. This book caught my attention in that Mary is a female Sherlock Holmes-type character. I enjoy a good mystery and unexpected twists. Yet, I struggled with this one. I'm not sure if it's because there was a large cast of characters and I wasn't completely sure as to how they were connected. Or if I got bogged down in tedious details. Either way it took me a long time to finish this book. Overall, the book was good. As the mystery unfolded, I have to give the author credit, I hadn't figured out the solution/guilty party early on in the book, like I usually do. I received this book for free from Blogging for Books for the purpose of reviewing. My thoughts and opinions are my own. Recommended to fans of Sherlock Holmes. After solving a case for the Brooklyn Police Department, Mary Handley is determined to become a private detective. Investigating a suspicious death leads Mary into society's upper crust, rubbing elbows with the Vanderbilts, Carnegies, and Rockefellers. Mary is a thoroughly modern girl in a world where very few people, especially her mother, appreciate investigative and physical skills in a woman. Lawrence Levy incorporates historical figures and detail but sometimes the facts seem forced rather After solving a case for the Brooklyn Police Department, Mary Handley is determined to become a private detective. Investigating a suspicious death leads Mary into society's upper crust, rubbing elbows with the Vanderbilts, Carnegies, and Rockefellers. Mary is a thoroughly modern girl in a world where very few people, especially her mother, appreciate investigative and physical skills in a woman. Lawrence Levy incorporates historical figures and detail but sometimes the facts seem forced rather than naturally occurring in the development of the story. Nonetheless, amidst a large cast of characters, Levy's plotting is complicated and substantial and Mary untangles the mystery gradually. When I saw this book I knew that it would be right up my alley. A perfect combination of Nancy Drew and Murdoch Mysteries, it’s a fun, intriguing historical fiction. I love that the protagonist is fearless in her ventures and will not back down. Emily Worsham approaches Mary directly asking her to assist with the investigation of her Uncle’s murder and two more murders draw Mary into a compromising position. I don't believe this book didn't get better reviews. I like the way it started, I never would have guessed about Vicky and Albert. (what their characters were about.) I love mysteries and I felt this was a good mystery. I will be looking for more of Lawrence H. Levy books. It kept me in suspense and I didn't guess who was responsible for paying for the murders until almost the end of the book. I love this series and the courageous and intrepid Mary Handley! Like the first book in the series, it is based on true historical events and features icons of American history. The story is also only too relevant to today's political climate - the more things change, the more things stay the same! Looking forward to more books in this series! This book was a fun read, but lacked in some places. I also found that the ending was very unsatisfying, but maybe that was just me. Though I usually am a fan of multi-perspective books, this book switched so frequently and a lot of times it was a little confusing. I love this series! This is the second book, and I think it's even stronger than the first. It has all the qualities of a great, historical, cozy mystery, but with a fresh edge to it. Can't wait for more! After the first few pages the story got choppy and began to disintegrate. I couldn't care about anyone and the plot flitted around from this person to that without giving the feel for the correct era or environment. Terrible advancement of plot and choppy writing.